In the spring we often find that our hives have had to cope with excess moisture building up over the winter months. When it's bad, winter moisture problems will lead to mouldy comb and cold water dripping onto and chilling the bees. The bees themselves will produce a great quantity of moisture just by living and breathing as water is a byproduct of consuming honey. Warm moist air rises, spreads along the top of the hive, comes into contact with the colder side walls and inner cover, condensation forms and drips back down into the hive. The simple and oft suggested remedy to this problem is to provide some form of upper ventilation. Some swear by the top entrance, but that option seems a little drastic to me as the bees are likely to lose much of their upward moving heat at the same time as the moisture (thus requiring more honey consumption, which will in turn lead to more moisture production). How can we avoid moisture problems while minimizing heat loss? I used to believe that the short answer to this problem is to insulate and absorb. That we needed to give the moisture somewhere to go and try to minimize the temperature difference between the surfaces of the hive and the cluster. Particularly the top surface of the hive, as moisture is most problematic if it condenses above the cluster and might drip back down onto the bees. 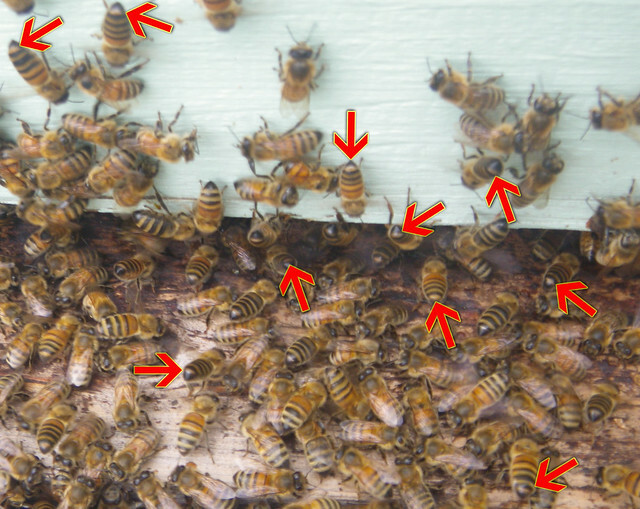 It's been suggested this problem might be less likely to occur in a wild hive, where the tree wall is thicker, and there is much more than a thin layer of wood above the hive. So how can we attempt to emulate those conditions with modern day man-made hives? 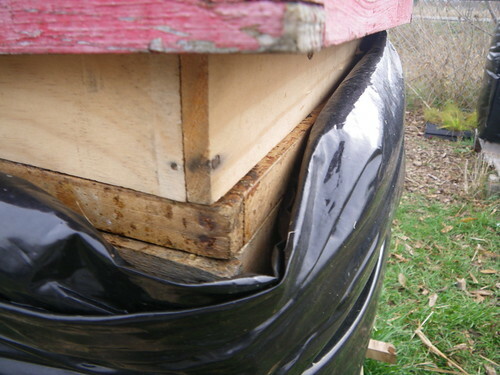 At first, aside from insulating the sides of our hives, we added 'ventilation boxes' or 'quilts' on top of our hives. Essentially a short box filled with straw, wood shavings or other absorbent material. 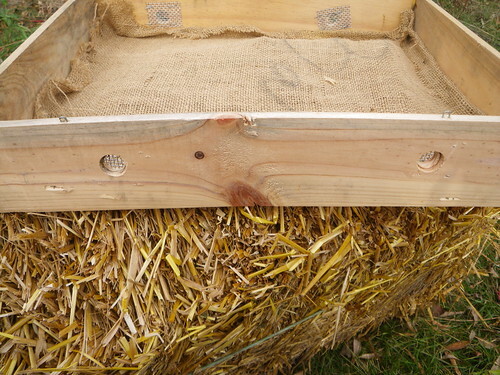 The side has screened holes, which keep the mice out, and allow moisture to escape. Burlap is stapled to the bottom. In the photos you can see we placed it above an inner cover with a vent hole, but it could be placed directly above a brood box. We used these during the 2011/2012 and 2012/2013 winters and had dry hives in the spring. In a few cases there was a bit of dampness in the ventilation box. It was a big improvement, but we were still reliant on small upper entrances. The trouble with insulation when it's wet is that it becomes less effective. I learned that in the warré hive design a quilt is typically placed on top of a top-bar cloth and is left on the hive all year long. Once the bees propolize the cloth, moisture is no longer able to be absorbed by the quilt, instead the quilt just serves to insulate. There isn't really any attempt to absorb water. With my initial experiment with a warré inspired design I noticed the bees also looked very cozy in their little boxes. Even a smaller winter cluster is very likely to have bees touching all four walls of the hive. I believe this could be an important factor that allows a colony to better control the humidity within their hive. Dennis Murrell noted in his experiments that smaller clusters are more susceptible to moisture problems. I have also discussed with a large scale beekeeper who felt that an upper entrance wasn't as necessary when squeezing colonies down into a single brood box for winter. Another idea kicking around in my head, that I do not have much evidence for, is that insulation might also help prevent moisture problems by preventing the hive from warming up too quickly. If condensation does form, and freeze at the top of a hive, perhaps the bees can simply drink it up if it doesn't melt too fast. Maybe winter moisture is even a resource that they can invest into brood rearing. Matt at beethinking.com has some data on the use of a quilt on a langstroth showing how its use stabilized temperature fluctuations in the hive. So I started using a hive very similar to the warré style. I built them with thick cedar walls, I place a quilt on them all year long, and I do not provide any upper ventilation. 2013 / 2014: was a particularly cold winter. The first year using warré hives with quilt boxes placed on top of propolised top-bar cloths. I checked the bottom of a few quilt boxes several times over the course of the winter. Though I didn't find any moisture build up, it was interesting to discover that on warmer sunny days, the temperature at the bottom of the quilt box would be a few degrees below ambient. 2014 / 2015: Another brutally cold winter. One colony had been blown over during an intense wind storm in early November. 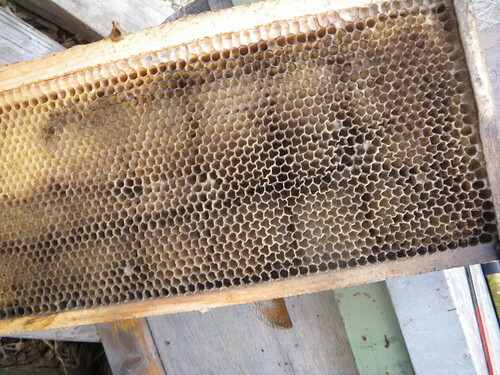 In the frantic process of putting the hive back together again, the proplized top-bar cloth was removed. The hive overwintered with only the quilt directly on the top bars. In the early spring the upper 3/4 of sawdust and straw was a little damp as was the roof. This was replaced with fresh dry material. 2015 / 2016: I successfully overwintered 9/9 warré inspired hives. Overall, it was a shorter milder winter then normal for Ontario, but we did see a few days with very frigid temperatures. I did see liquid on the bottom board from time to time, but very few bees died in the hive, and there was no evidence of moisture impacting the bees. 2016 / 2017: Another mild winter. 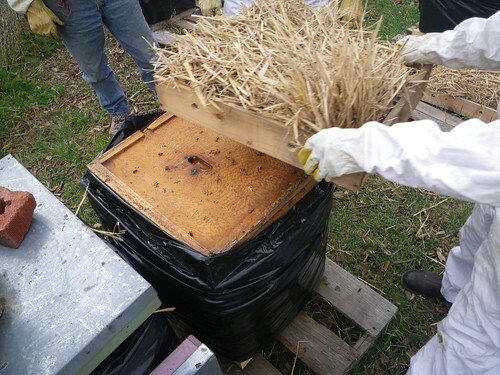 Unfortunately, seven hives at one location were vandalized and died as a result. 2/2 hives at another location, not only survived, but were ridiculously strong in the spring. 2017 / 2018: Mild fall, but a real cold Canadian winter followed by a freezing spring. 6/6 colonies survived. After five years of doing this I think it's safe to say this is no longer a risky experiment anymore. It's official. Honeybees do not need any upper ventilation in Southern Ontario if properly prepared. In two cases quilt boxes were mildly damp. I attribute this to an older top bar cloths, one that had a very tiny tear and one that left a miniscule gap at one corner. 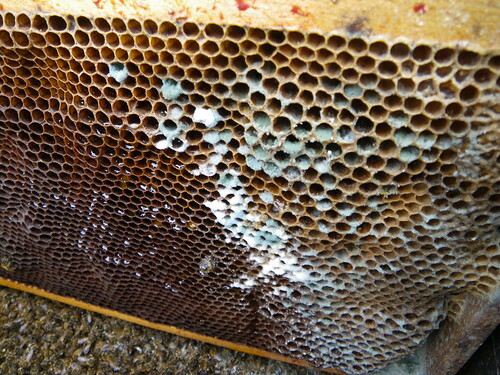 One hive a bit of mold on the top bar ledge of a lower box (suggesting some condensation formed below the cluster). Overall they were strong vigorous colonies ready to jump all over the first flowers when they finally arrived at the end of April.